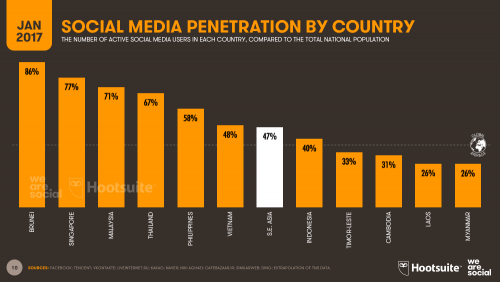 “We Are Social” reported that as of January 2017, Philippines has 58% of active social media users compared to the total national population. The said report is substantiated by a report from Hotsuite blog wherein it stated that there are 500 million tweets per day, 890 million people use Facebook daily, and 95 million photos and videos are uploaded to Instagram every day. What do these statistics about the use of social media mean to your business? How will your business benefit from these? Now that we are in the age where almost everything is done by a push of a button or a click of a mouse, being visible online offers a lot of benefits to a business. Social Media is one “powerful highlight” on the line. Through the years, Social Media has helped several businesses connect with their existing customers and at the same time allow new customers to connect with them. Facebook, Twitter, Instagram and YouTube are the top social media networking sites tapped by many businesses nowadays. Having a strong online presence has been a great help in reaching their customers, prospects, and business partners. Writing a good content on your social media can make it “viral.” If you share the latest trends and keep up with what is new, you will easily get both local and global audiences. Social media tools like “hashtags” can help people to easily look for their particular need. Once you acquire a large number of audience, you will be able to hook potential and valuable customers. With millions of users on Facebook, Twitter, Instagram and other social media networking sites, there is a huge number of people that your business can reach. Not everyone might have heard about your brand, especially if you are a newly-established business, so take advantage of the social media. Bear in mind that every social media account you create as part of your marketing strategy is a doorway to your website; and every bit of information you share on your account is a chance to obtain new customer. Social media is becoming the common instrument for marketing or advertising a business. By having your own account, your business can gain opportunities for conversion of sales. Every post, image, video and article you post draw your potential customers to your company’s website. When a business is active on its social media accounts, such as posting pictures or videos of their products and services or by replying to customer inquiries anytime, it generates a positive impression to its target market. Social media as one of the wide communication channels provides a quick way to obtain customer feedback and insights. If you are engaged with social media, you can instantly address customer’s concerns or complaints, if any. Furthermore, having an interaction with your customers in real time earns their trust and confidence in your brand. Social media has the ability to provide value to your target audience by giving informative, interesting and latest updates about your business. If your business is up to date and can provide essential insights that a customer is looking for, you can become a source of information to your customers. Providing valuable and captivating content will help your existing customers turn into loyal customers. Then they will be happy to refer their family and friends to your business as well.